MobileWorks launched last summer with a simple, yet big mission: Build a viable alternative for Amazon Mechanical Turk and in so doing create a motivated, happy and accurate virtual workforce. While Mechanical Turk has its appeal, as a way to hire cheap labor to complete basic tasks through an online, crowdsourced marketplace, but the system is set up in such a way that workers tend to be anonymous, underpaid, don’t have much incentive to do good work, and largely ignored by Amazon. MobileWorks set out with a different approach (and a social mission) — to pay workers fair wages and create a collaborative online work environment in which microwork would become less anonymous and more like a self-organizing virtual office. The startup believes that this approach can lower the cost of obtaining quality work or results, pay fewer workers more and, in so doing, enable non-enterprise (i.e. 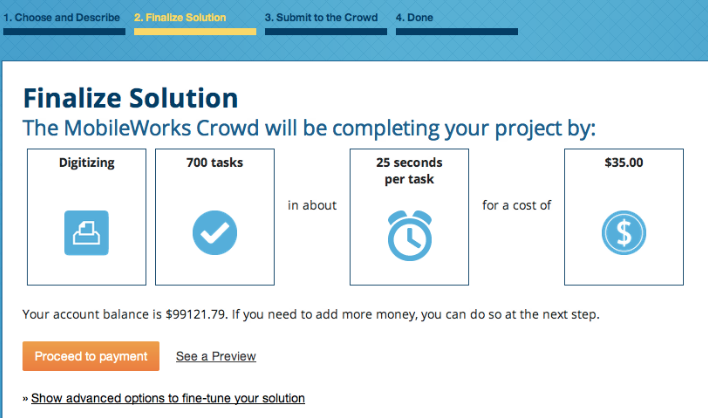 smaller companies) to tap into the benefits of crowdsourcing. So far it seems to be working, as the company announced today that its workers have collectively completed one million commercial tasks since launch. What’s more, companies have effectively outsourced five continuous years of work in the last year by hiring its cloud-based crowd, which the team believes is a testament to how much businesses can accomplish by collaborating with a virtual labor pool. This traction, although not mind-numbing, provides some early validation for the startup’s approach and has attracted investors, leading to the startup raising a sizable seed round earlier this year. Although the co-founders remained tight-lipped about numbers, we did learn that its investor roster included names like Andreessen Horowitz, Recruit Strategic Partners, Bee Partners, FirstLight Ventures, Hub Ventures, Y Combinator and SV Angel. But why are investors interested in MobileWorks — and just what kind of work does its virtual workforce do exactly? Well, out of those aforementioned million tasks, unsurprisingly the majority came from data-intensive tasks like lead generation, online data collection, content moderation and video and audio analysis. However, according to MobileWorks co-founder Anand Kulkarni, while tasks were predominantly data-intensive, the startup has begun to see a wider range of inbound work, with its crowd now having worked on tasks ranging from managing a Twitter account to digitizing stacks of business cards. And the benefit, in MobileWorks’ conception, is that its quality-driven, virtual workforce allows businesses to afford the kind of outsourced labor they wouldn’t were they to hire workers in-house. In fact, many of MobileWorks’ business clients — the users of those first million tasks — were startups that built entire products while using MobileWorks’ labor force. Jessica Mah, the young CEO of Indinero (the company which has been dubbed “The Mint.com for small business”) said that MobileWorks had become the backbone of a few of its major products. A feature of its iOS app, for example, requires that it reliably convert information from photos of receipts into digital form. While tedious, an important task for Indinero to do (and do well) in order to offer superior functionality or features than the next app. Of course, for small teams, this kind of stuff distracts from more crucial jobs, so being able to outsource to MobileWorks is huge, Mah says. Interestingly, while MobileWorks has found its way to what appears to be a workable model, this isn’t where it started out. When it graduated from Y Combinator last summer, MobileWorks had built a service specifically for developers. The model was similar to that of Mechanical Turk, with the main difference being that it was composed of highly-screened workers and used algorithms to ensure quality. But it was API-only. The team found that its model wasn’t as appealing to developers as it was to SMBs and businesses, who were more interested in the product itself. Today, MobileWorks has built a cloud labor service for business that it believes to be the opposite of Mechanical Turk philosophically. The idea being that treating people better and making online work less anonymous and more like a virtual office is a win-win for everyone involved. As part of this, the startup has launched a new web interface that business users can use directly. Its new technology routes tasks to the workers in the crowd best-suited for that kind of work enabling companies to get good answers just by asking a few workers. In pushing its social mission, MobileWorks gives workers incentives to do good work under their real names, set prices that pay them fair rates, offer opportunities for skill development and advancement and enable them to choose the tasks they enjoy the most. Another fundamental part of its social mission is promoting self-organization — both because it’s a fundamental right (of the employee) but also because it helps the bottom line. MobileWorks automatically identifies its brainiest members and calls on them to manage the rest of the crowd, with the top one percent of the workforce being able to review everybody’s performance, train workers, hire and fire, and review answers. It’s potentially dangerous, but it also has a lot of advantages. The brainier members of the crowd don’t feel like they’re bored or being held down, others get a sense of the opportunity for upward mobility. What’s more, the crowd is just much more likely to be content and produce good work if it’s policing and monitoring itself, instead of feeling like Big Brother is watching. And that’s good for business. On the flip side, the value for its clients is inherent in virtualization. MobileWorks removes the need for companies to sink cash into heavy development or custom-made enterprise solutions or millions of drones for their data entry and so on. The goal then is to allow businesses to just sign on and send work through its web interface, then kick back and take solace in the confidence that the job will be done right. Naturally, this model has proven far more useful for startups than developers, which was MobileWorks’ initial focus, because all they have to do is just post work in a few lines of code and trust the crowd will get it done — why the company has seen so many startups looking to subcontract their labor requirements with MobileWorks. Although the startup’s scope has changed, what Jason pointed out last year remains true. There’s plenty of room for improvement in this space, and there are a lot of underprivileged, underemployed workers out there in developing parts of the world who can be trained to be effective workers within MobileWorks’ framework — which, in turn, can help lift them up. But, as always with crowdsourced labor, it all comes down to ensuring quality. If the startup can use its algorithms to boost quality and find ways to optimize processing and completion of those manual tasks, its user base could be seeing quite a few additions in the near-term. For more, find MobileWorks here.